Last summer I met my friend Amy at the Great American Scrapbook Convention in Arlington, and we enjoyed a scrapbooking layout class that included a kit to create five two-page layouts using the Paper Loft Euphoria Collection. I only completed one layout during the class, and the kit has sat untouched until earlier this month! I spent two days at the Whitworth Ranch Retreat in Scurry, Texas, and put together the remaining four double-page layouts. Then last week, I pulled those layouts out and started flipping through my photo storage binders to find photos that worked well with the colors and designs. I ended up with seven layouts (two double-page and five single-page), plus a single page that I haven't chosen photos for yet. First, a birthday layout from Robbie's birthday in 2011. (Yes, I still have photos to scrap from that many years ago!) The only additional embellishments I added were the title and number stickers. The playground photos from an INSPIRATION day in 2013 worked perfect for another page. I added three camera wood veneer embellishments and a tiny bit of written journaling, but otherwise I simply had to crop and adhere my photos. 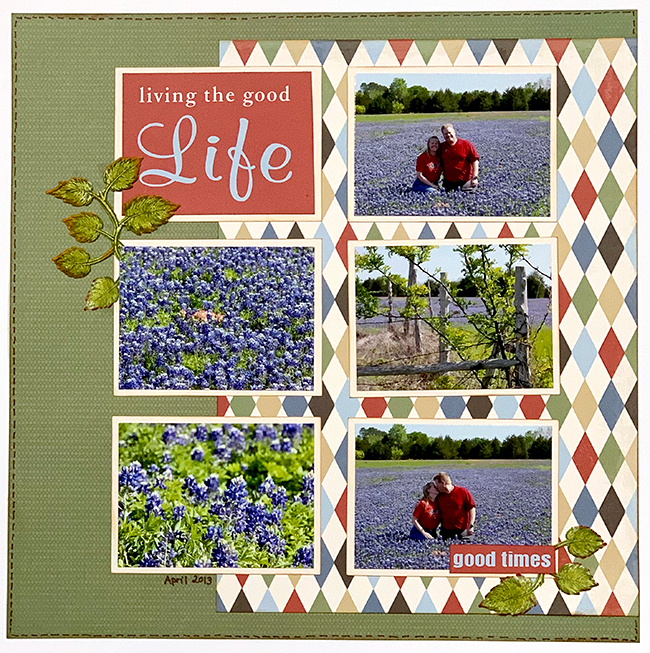 Another beautiful day in the spring of 2013, Robbie and I had some photos snapped of us in a field of bluebonnets. (If you look at the layout above and this one, you can see that the pages were designed as a two-page spread, but I think they work great separately as well!) The green leaf embellishments were left over from the Classic Sunflower Card Class I took back in October. 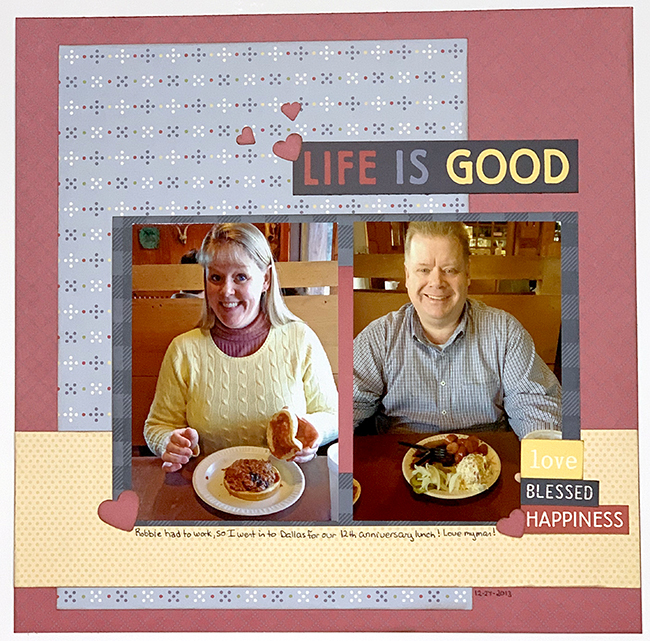 I only had a couple of photos from our 12th anniversary lunch, and they worked nicely on another page. I added a few punched hearts, a line of journaling, and some extra word embellishments from the original kit for this easy layout. The FUN photos from our trip to a Corn Maze in Ohio with Robbie's brother and his family filled out a two-page layout. 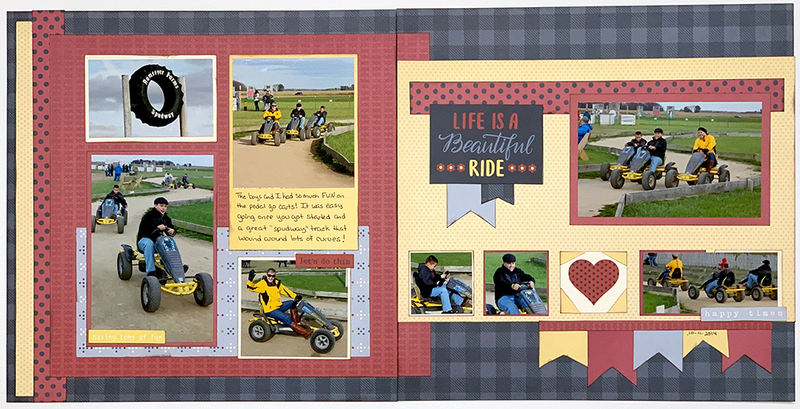 Our nephews and I had a great time racing on the pedal cars and the title block that was on this layout was perfect! 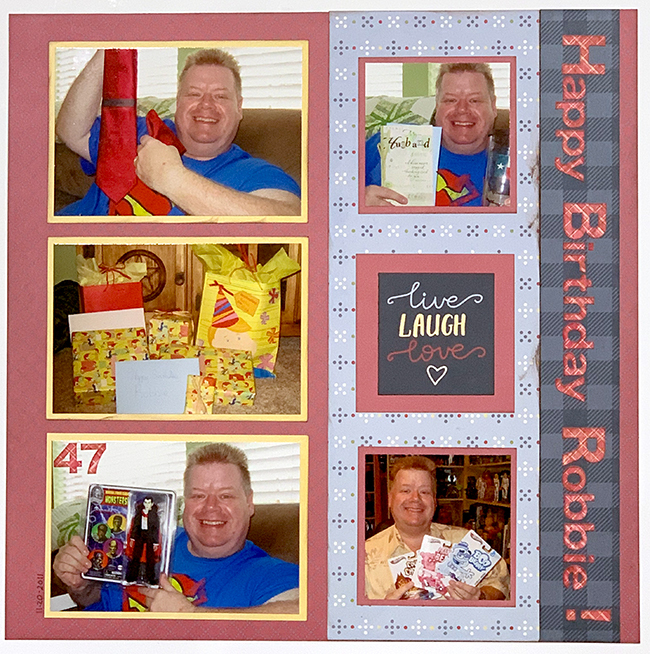 Another FUN time that year was a visit from Robbie's brother and the gifts he brought for Robbie's 50th birthday. I especially like how the colors in the photos work so well with these papers. I actually did a little stamping for this page to create the layered circle embellishments and the Happy Birthday at the bottom! 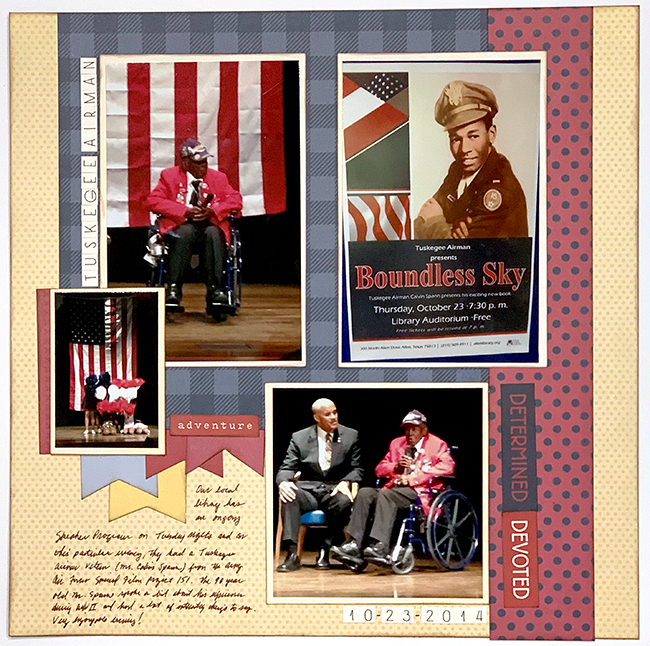 On another page I added photos from one of the programs at our library in 2014. One of the surviving Tuskagee Airman spoke about his time serving during World War II. 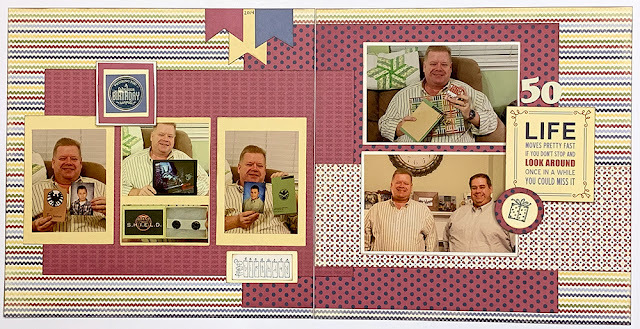 I included a couple of extra photos on this layout and then had Robbie add the written journaling. I rarely use scrapbook kits since I like to begin a layout with my photos; however, I'm thrilled with how these layouts turned out. Having an abundance of photos to choose from made it fairly easy to find photos to go on each page. I'm inspired to pull out the few other kits in my stash and put them together soon! Do you use kits in your scrapbooking? You did a great job with these. The very first layouts I created were at a class where we did the design first and then the photos. I still have that layout, but the process has never worked for me. Has to be photos first! Actually, it's been several years since I did a 12X12 layout. Pocket scrapbooking has its disadvantages, but works for me. I don't do paper pages anymore - with digital it is easy to resize photos or recolor elements to make everything work together. But yes, I scrapbook with kits! You did a fantastic job of making it all work with these pages. All really nice layouts. I'm always looking for a way that will work for me in the process of whether pages first, then photos or photos first then pages ... maybe a blend of both styles. I like the Texas bluebonnets, they are very similar to our lupines. Oh these look great - well done on finishing off the kits. I like scrapping both digi and paper with kits, means quite a bit of work has been done and I have more time to play! But I'm not so good at the ones I've picked up as class kits, I went through and disposed of a big box of those before leaving the meeting house - which thrilled another friend who took the whole box and put together two albums (not completely full!) from them for her family. You've created a set of lovely pages. Doesn't it feel good to find a permanent home for those older photos? Sunday Musings | Are You A Mary or A Martha? Hello 2019 | A Year of SIGNIFICANCE!